Goji berries are high in antioxidants that can exert a beneficial effect in terms of your overall health. Goji berries—Asia’s answer to North American blueberries—rate high when it comes to carotenoid content. Carotenoids are a class of antioxidants that exert protective effects right in the heart of a cell. Carotenoids protect cell barriers that surround individual cells and the mitochondria within these cell walls. Like blueberries, goji berries are high in two carotenoids that benefit eye health: zeaxanthin and beta carotene. Research has mined the potential of goji berries to protect against cancer, UV radiation, and immune disturbances. Now, studies have shifted to how the berries can help to protect the complex interactions of specialized cells within the eyes. Together, these cells allow the eyes to see. But they require an enormous amount of nutrients and are particularly susceptible to damage from toxins, radiation, and other pathogens. Goji berries could help play a significant role in the nutritional needs of your eyes. The antioxidants in this small powerhouse berry can help fend off damage to the macula and the retinal cells of the eyes. In fact, goji berries are so well suited to protecting the eyes that they may even be able to help diabetics suffering from diabetic retinopathy. Diabetic retinopathy is a leading cause of vision loss. When retinal epithelial cells start to die, the diagnosis of diabetic retinopathy usually follows quickly. 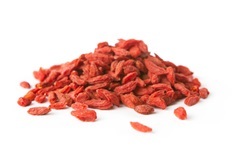 Taurine, a mineral that is thought to help treat diabetic retinopathy, is found in abundance in goji berries. Researchers tested both taurine on its own and taurine-containing goji berry extract in damaged human retinal cells. Retinal cells begin to die when blood glucose levels in the body get too high. The research team found that the goji berry extract helped to protect the retinal cells from dying, despite the fact the cells were exposed to a high glucose environment. If you want to add goji berries to your diet—especially if you have diabetes or are worried about the health of your eyes—you will have to eat the dried berries. Fresh goji berries are only available during the harvest season and are not usually exported to North American markets. There are two types of goji berries: Himalayan and Tibetan. Both are similar in nutritional content. Eat goji berries like you would raisins. You can add them to yogurt or cereal for breakfast, or eat a handful for a snack. Here’s one trick for getting around the fact that only dried berries are available for purchase. Soak the berries in water and heat in the microwave for about a minute. You can also drink goji berry juice, which is high in antioxidants just like the dried berries, though you will lose some of the fiber content. Traditionally, the Chinese add goji berries to soup, so give this a try at home. Look for goji berries in the dried fruit and nut section of your supermarket or check your local health food store. Song, M.K., et al., “Reversal of the Caspase-Dependent Apoptotic Cytoxicity Pathway by Taurine from Lycium barbarum (Goji Berry) in Human Retinal Pigment Epithelial Cells: Potential Benefit in Diabetic Retinopathy,” Evidence-Based Comp and Alt Med. Volume 2012.